The day finally dawned when we were to leave for Italy – Good Friday 18th Apr’03. Our flight was actually at 6:00 am Saturday morning, but since there was no connecting bus to the airport from where we stayed so early in the morning, we had no choice but to go and wait at the airport overnight. Well, so we left by the coach (bus) at 8:10 pm on Friday. The day was rather warm and sunny ( about 20 degrees ) Reached Stansted airport at 10:30 pm. Can you believe that there were lots of people already settled cozily in the cushioned benches, all ready to go to sleep? We settled down on a bench and tried to catch some sleep. The smell of roasted coffee emanating from a nearby café was too tempting to resist, so we had a nice cup of coffee. Then we settled down and caught some sleep. The flight was at 6:10 am so we had to check-in by 4:10. We were shivering in the cold as we boarded the plane (Ryanair) even though the sun was just rising. Since it was a small airline, there was no aerobridge so we just walked to the plane Had for the company a young traveler who was going to Italy to meet his girlfriend. We were informed that we were about to land in Rome Ciampino airport at 9:15 (15 mins before schedule). As we approached the runway we could clearly see the dome of the Vatican and a lot of other huge ancient monuments in the bright sunlight. After landing in Rome we took the Ryanair shuttle to the Termini station. After a short journey by bus, we reached our hotel called Pop-Inn Hostel. Left our luggage at the reception at check-in was only at 1:00 pm. So we decided to have a look at some attractions. An interesting piece of information — In Italy, one has to buy tickets for the bus/trains at tobacco shops (Tabacchi in Italian). Strange !!! And even if you have a ticket it is not valid unless you get it validated at ticket validating machines installed in the bus or at the railway platforms. We were once caught in a situation where there were no tobacco shops open to buy a ticket. So even though we had the money and could see the bus passing in front of our eyes we could not board it. Finally, an old Italian gentleman was kind enough to give us two tickets from the bunch of tickets he was carrying with him (we paid for it of course). In Rome, a day-pass costs  3.10. This is valid on all local buses, trains, and trams. The underground train system is not very useful as there are just 2 lines crossing each other at the main train station called Termini. The bus service is quite good provided you understand the routes. We went to see the Colosseum. 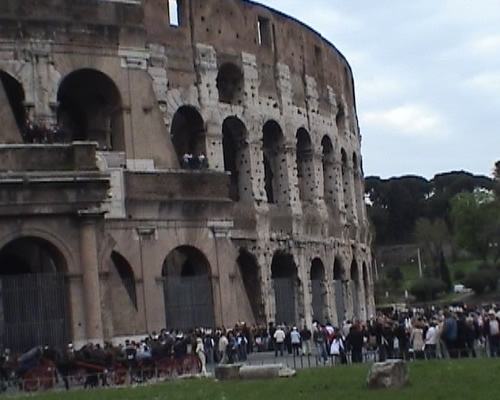 The Colosseum is actually a stadium inaugurated in 80 AD. It took ten years to build and stood 160 feet high with 4 stories and 80 arches. This massive structure could seat up to 50,000 spectators. Here, gladiators (condemned criminals, prisoners of war and slaves) fought each other as well as with animals mostly until their death. It had subterranean chambers where gladiators and wild animals were kept prior to their performance. It seems that the arena could be turned into a forest and could be flooded as well (to witness mock naval fights). There was also a system wherein the stadium could be covered so as to protect the spectators from the sun and rain. What a bloody form of entertainment. We then went to the Palatine hill next to the Colosseum – this was once the garden of the Roman emperor’s residence. Here we found some shade and settled down for a lunch. We then proceeded to the hotel for check-in, refreshed ourselves and then went to see the Pantheon. The square near the Pantheon called Piazza Della Rotonda was bustling with tourists from all corners of the world. At a street corner near the Pantheon we came across a “Gelati” shop – well that’s Italian for ice-cream. There were flavors which we had never heard of before. We liked, in particular, the “ananas” flavor – yes pineapple is called ananas in Italian. The ice-cream was fantastic. We took a large cone but soon realized that it was too much for us – it was thick and creamy. On our way to the Pantheon, we came across a shop selling wooden articles – mainly toys, fridge magnets, etc. There were a few wooden clocks as well. It was a wonderful sight to see such beautiful wooden articles all under the same roof.